This has to be said because there are some out there who are having a rough day today... or a bad month... and I really want you to know this. Hits, kicks, bites, throws things, is a runner, throws tantrums, cries, draws all over your couch with Sharpie, doesn't sleep, won't eat anything you cook, climbs on the table, etc. You are NOT a bad parent... even if you feel like it sometimes. A month or two ago when my youngest was in the throes of a huge hitting phase I had a few days where I would either snap and get really angry or where I would just have a private meltdown once he went to sleep. I wouldn't necessarily get mad at the toddler... but I'd get frustrated at my older kids for no reason because I was mad at my toddler. How can anyone be mad at a toddler though, right? So then I just felt guilty. I felt like a bad mom because I was annoyed with my toddler. Then I felt like a bad mom because I must be handling the situation wrong or I was actually causing the problem. The reality was, my son was going through a stage. I was using my best strategies to handle it... and it took consistency and time for him to move through it. I had the same experience last year when my daughter went through a huge anxious phase (that has fortunately calmed down a little). I blamed myself for her challenges. I told myself that if I was more patient or less busy or would spend more time with her, it wouldn't have happened. I felt judged constantly and I doubted myself every day. I thought I had ruined my family. I hear all the time (and say all the time) that we should NOT take toddler behavior personally or too seriously. That we just need to be calm and not overreact and set limits and be consistent and everything will be OK. But... that is actually really hard to do when it comes to reality sometimes. On those days when it is just you and three frustrated kids and tons of things to do or places to go and you have had two hours of sleep and you go to that event you've been looking forward to for forever and then your toddler breaks something or has a giant meltdown or bites someone's kid and you leave disappointed, mad at yourself, mad at your situation. Those sort of days are just plain lame.... and sometimes at the end of those days, I just get home and think, I am just a bad mom! I get frustrated too much. I am not organized enough. When I am overtired and stressed it is pretty easy for things to spiral out of control. 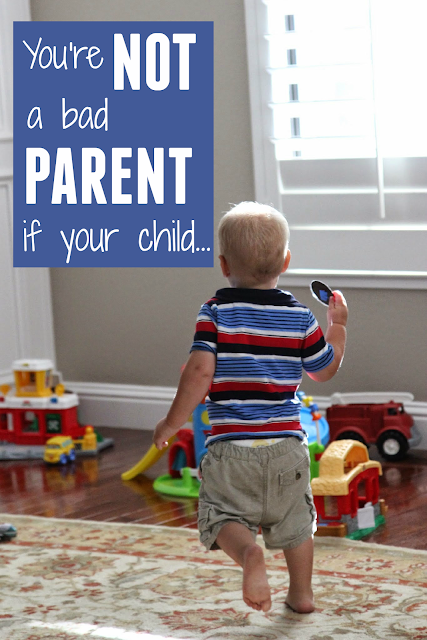 I've heard so many moms says that they feel like they are bad moms when their toddler has challenging behaviors like hitting, kicking, biting. They feel so uncertain with how to help their child... and other moms are often not understanding or helpful, which just makes it worse. I think that if you are trying to teach your child and you are trying to help that child be better and do better... then you are a good parent. Your child's behavior doesn't define you. How you react to it can though... which is why I am always trying to DO better and BE better as a mom... even if I fail sometimes. The guilt that I want to banish can actually be a good thing too. It drives me to try harder and not give up. It encourages me to look outward to the amazing parenting examples I have in my friend group, family, community, and online... and ask for help! B.F. Skinner said, "A failure is not always a mistake, it may simply be the best one can do under the circumstances. The real mistake is to stop trying." So if you are having a bad day today or you are feeling like the worst parent ever... remember that you can put the brakes on the day right now and turn it around and make tomorrow (or today) a better day. 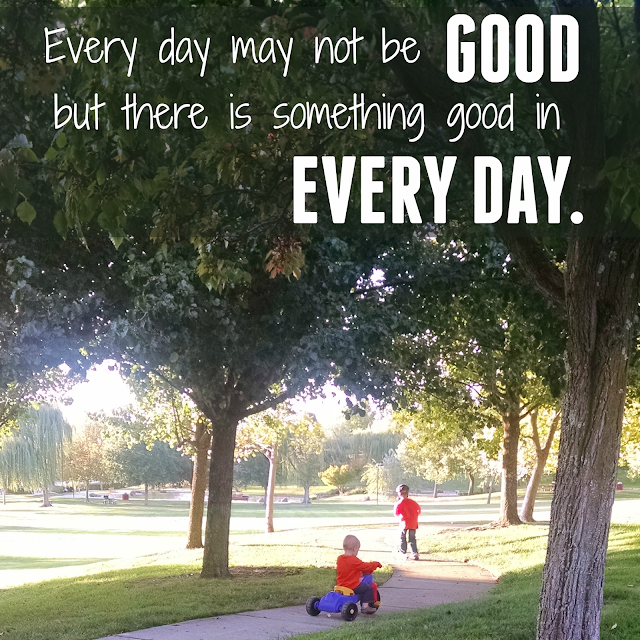 I love this quote that says, "Everyday may not be good...but there's something good in every day." It is totally worth remembering and repeating on a daily basis. What challenging behaviors or situations make you feel that way? Have any tips for other parents that are feeling this way? You can also find many other parenting resources on my Becoming a Better Parent pinterest board. Happify.com - seriously, take a few minutes a day and log in. You don't even need to subscribe to the paid service to see the benefits. All it does is train your brain to see and focus on the good stuff in our lives, and sometimes we just need some help with that. Just came across the article on pinterest and it was exactly what I needed to read today! Thank you. I definitely had "one of those days" today. Fortunately a few woman around encouraged and reminded me that they had been there before. It is so helpful to know you are not alone!